Rugged 3-1/2" O.D. zinc undercoated steel upright with 3' extension. Uprights are powder-coated in your choice of black, royal blue or forest green. Fan-shaped aluminum backboard - 36" x 54" powder coated white with border and target. Single rim goal - heavy duty goal and nylon net included. Backboard and goal are directly mounted for exceptional strength. Outdoor basketball unit with backboard and goal directly mounted to a welded plate on the gooseneck for durability and stability. Includes 4-1/2" O.D. galvanized gooseneck with 4' offset, 36" x 54" Fan Aluminum Backboard and Super Goal. Outdoor basketball unit with backboard and goal directly mounted to a welded plate on the gooseneck for durability and stability. Includes 4-1/2" O.D. galvanized gooseneck with 4' offset, 42" x 72" Aluminum Perforated Backboard and Double Rim. Outdoor basketball unit with backboard and goal directly mounted to a welded plate on the gooseneck for durability and stability. Includes 4-1/2" O.D. galvanized gooseneck with 4' offset, 42" x 72" Steel Perforated Backboard and Super Goal. Outdoor basketball unit with backboard and goal directly mounted to a welded plate on the gooseneck for durability and stability. Includes 4-1/2" O.D. galvanized gooseneck with 4' offset, 42" x 72" Acrylic Backboard and Super Goal. Outdoor basketball unit with backboard and goal directly mounted to a welded plate on the gooseneck for durability and stability. Includes 4-1/2" O.D. galvanized gooseneck with 4' offset, 42" x 72" Rectangular Steel Backboard and Super Goal. 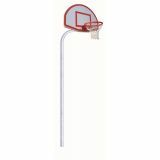 Straight pole basketball unit includes 4-1/2" O.D. galvanized upright, 48" long 3-1/2" O.D. x .165" W extension arm with direct goal mounting plate, 1.90" O.D support struts, 36" x 54" Fan Aluminum Backboard and Super Goal. 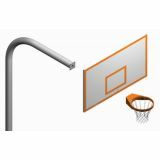 Straight pole basketball unit includes 4-1/2" O.D. galvanized upright, 48" long 3-1/2" O.D. x .165" W extension arm with direct goal mounting plate, 1.90" O.D support struts, 42" x 72" Perforated Aluminum Backboard and Super Goal. 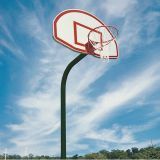 Straight pole basketball unit includes 4-1/2" O.D. galvanized upright, 48" long 3-1/2" O.D. x .165" W extension arm with direct goal mounting plate, 1.90" O.D support struts, 42" x 72" Perforated Steel Backboard and Super Goal. 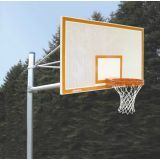 Straight pole basketball unit includes 4-1/2" O.D. galvanized upright, 48" long 3-1/2" O.D. x .165" W extension arm with direct goal mounting plate, 1.90" O.D support struts, 42" x 72" Acrylic Backboard and Super Goal. 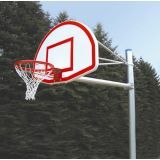 Straight pole basketball unit includes 4-1/2" O.D. galvanized upright, 48" long 3-1/2" O.D. x .165" W extension arm with direct goal mounting plate, 1.90" O.D support struts, 42" x 72" Rectangular Steel Backboard and Super Goal. 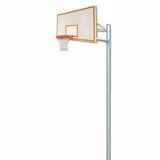 Outdoor basketball unit with backboard and goal directly mounted to a welded plate on the gooseneck for durability and stability. Includes 5-9/16" O.D. galvanized gooseneck with 6' offset, 36" x 54" Fan Aluminum Backboard and Super Goal.